As I got started on making over this room, I knew I wanted to change the dark furniture pieces. I love the style of both of these side tables, but they needed to be updated with some color to fit in with the overall look I’m going for in this room. Gloria and I discussed an appropriate decor name for my Charleston Room and she thought “coastal cottage” was the perfect way to describe it. 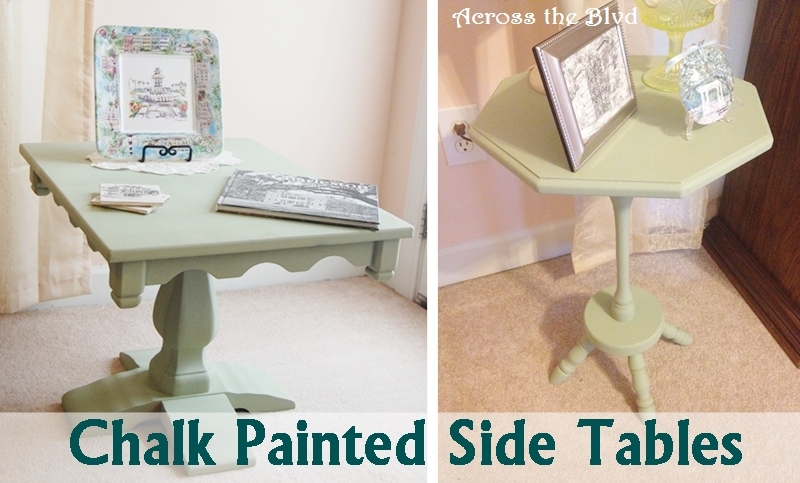 Have a look at how I changed these two side tables to work with that style. These two tables are pieces that I’ve had for a number of years. Neither of them are old enough to be considered truly vintage, but they are both around twenty five years old or so. My mother had them in her store once upon a time and when she closed it, she had them at her house for a while before passing them on to me. 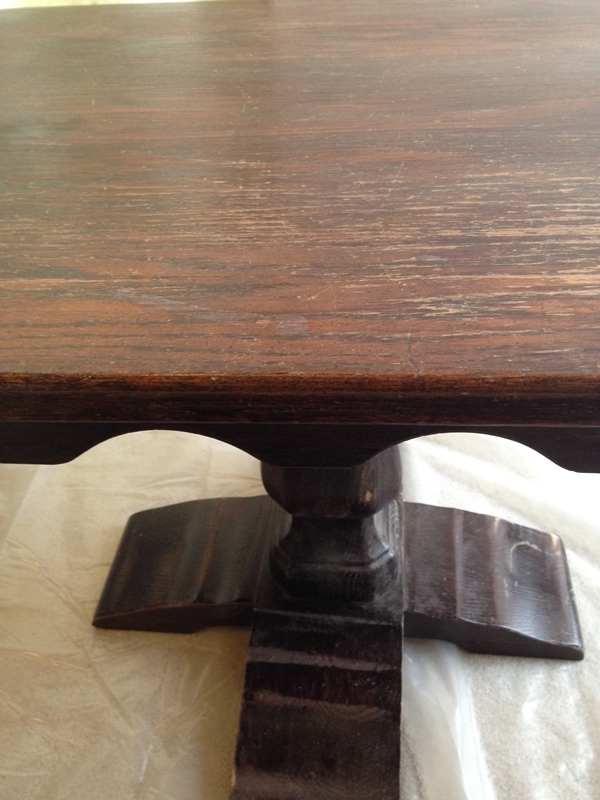 When you see a close up of the table, you can see that it was in need of a makeover. 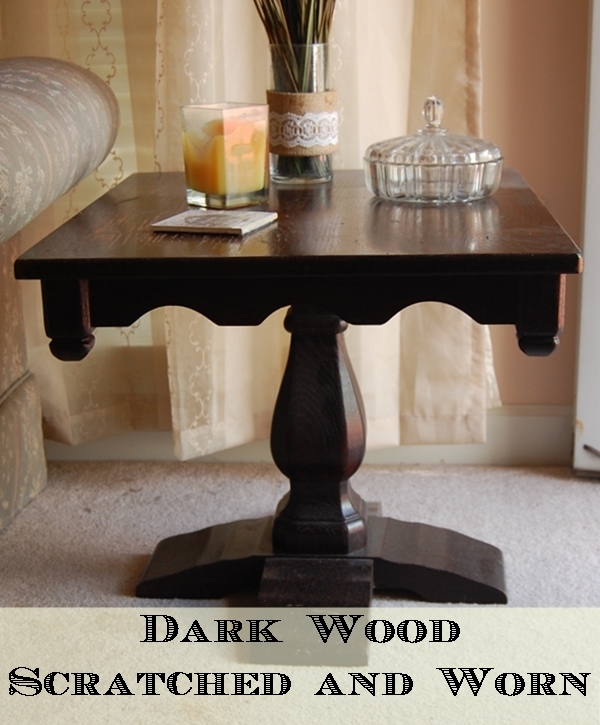 The spindle table was also dark wood and in need of some updating. 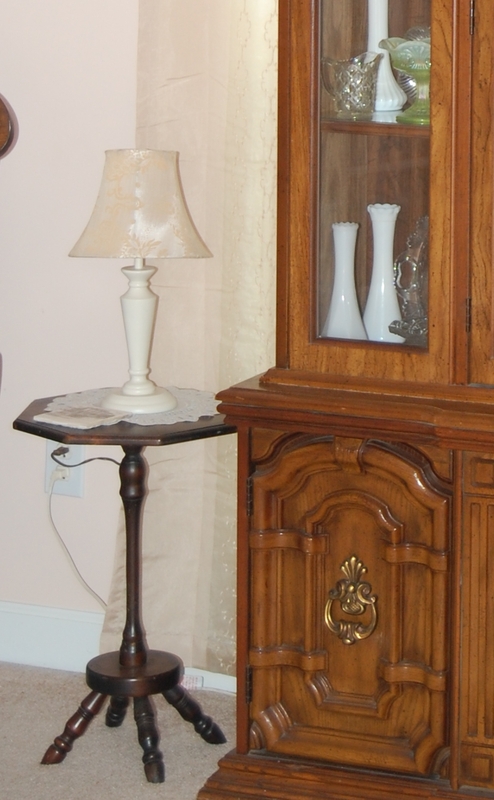 You can also see that I had several different wood tones in the furniture in this room. 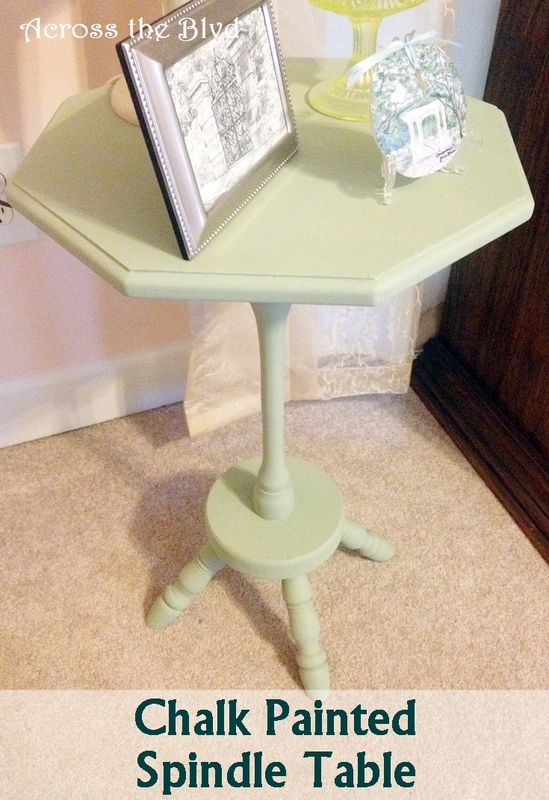 Since both of these pieces were small ones, I decided to use an inexpensive chalk paint. 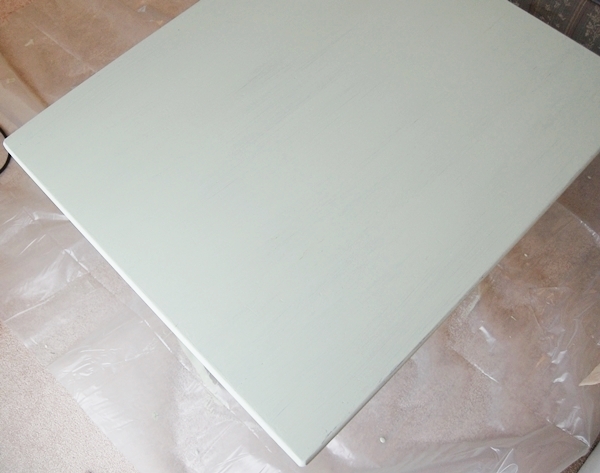 This is the same paint that I used for the picture frame that I turned into a coffee table tray. It’s Waverly Inspirations in Celery. It goes on nicely and covers well after a first coat. This paint dries very quickly and I was ready to add a second coat after about 15 minutes. I decided against distressing these pieces because I knew I was going to distress several other pieces in the room and I didn’t want to go overboard with the distressed look. 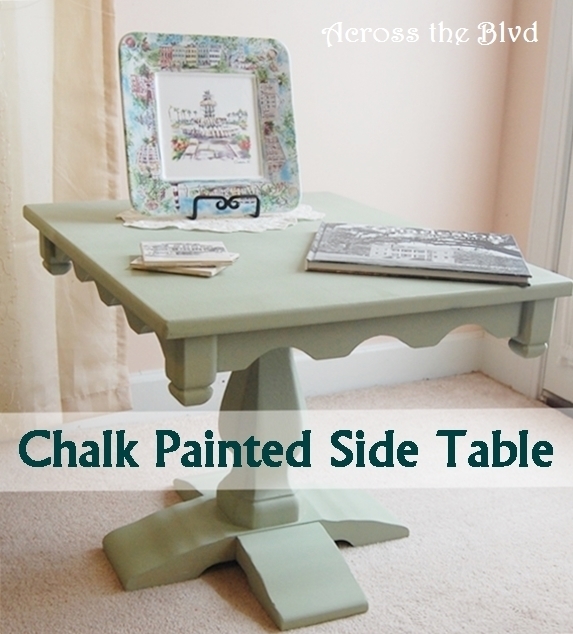 I like the smooth look that the chalk paint gave. I used Waverly Clear Wax on both pieces once the paint was completely dry. I used a wax brush to put it on and a cheese cloth to wipe it away. Both of these pieces turned out just the way I had hoped they would. With these two items checked off my To Do list for this room, I was ready to tackle more projects. My next project was a matching coffee table and side table. 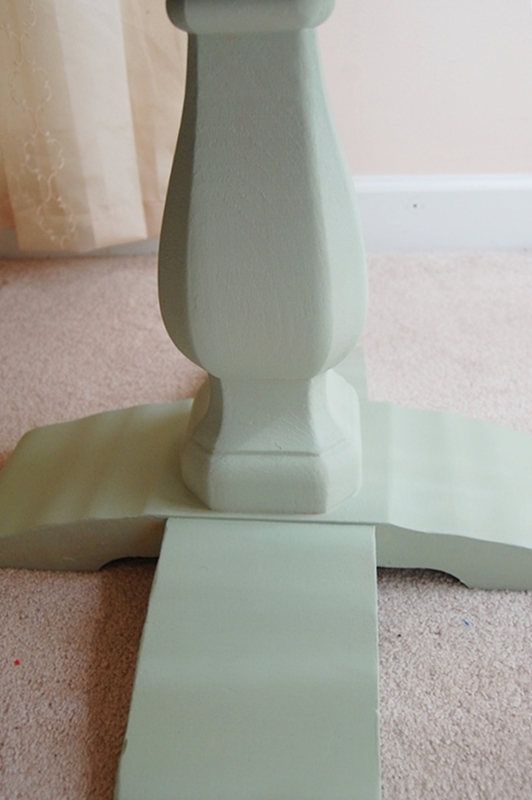 For those pieces, I decided to use Annie Sloan Old White for the first time. I’ll be posting that soon and would love to have you follow along this series of posts. The tables turned out wonderfully. Love the color choice! I’m curious about using wax as I have never used it – it would seem to me that dust would collect and be hard to wipe away because it would stick to the wax? I’m sure I must be wrong with so many people using that as a finish – what have you found? Do you like it better than a varnish type finish? Thank you, Laurie! I’m happy with them. After applying the wax, you wipe it off really well and it doesn’t leave any residue, so dust and such doesn’t stick to it. I’ve been pleased with this finish. Beverly, those are such great tables; and I love the new color. Thanks for sharing and thank you for popping in for a visit at The Dedicated House. 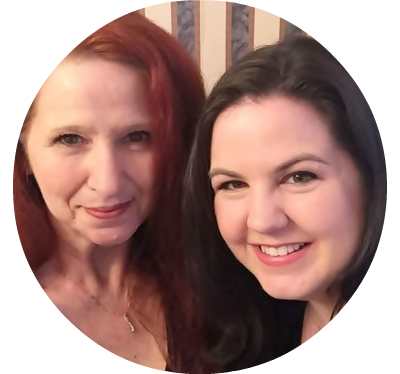 Feel free to share this post at my Before & After party which is currently live. Thank you so much Kathryn! Thanks for the invitation to your party, too. I’ll stop by and link up. It is! I’ve been experimenting with different brands, plus a DIY recipe. Thanks so much. I loved what you did with that mirror! So pretty. Thanks for stopping by! 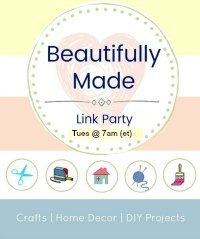 Thanks for pinning, Linda! I hope you’re having a great summer, too. 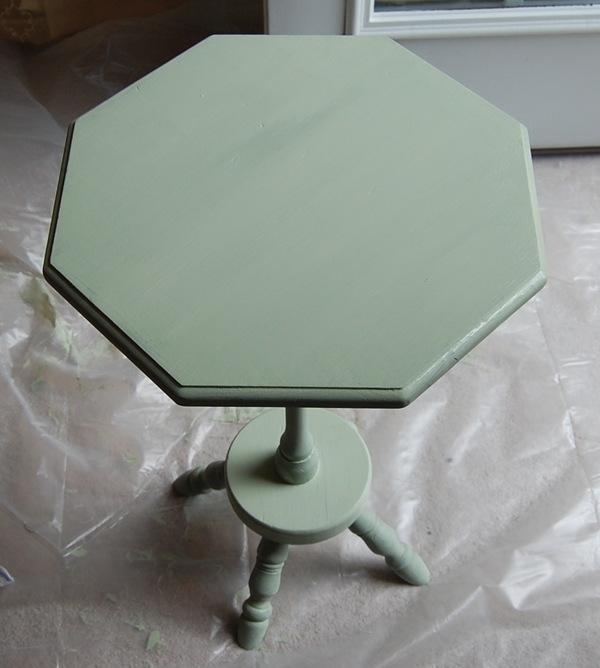 I love chalk paint. Your tables turned out great and I can’t wait to see your completed room makeover. It’s so easy to work with! Thank you. The room is definitely a work in progress. Thanks so much for stopping by. Thank you, Mary. I’ve been putting this off for too long. I’m excited that it’s coming together nicely. So nice of you to visit! I’m going to check out your buffet decor. I love no cost decorating, too. Hi Beverly! Thank you for sharing. You are one of the features at the Round-Up from the Before & After Wednesday party at The Dedicated House. Oh wow! Thank you so much, Kathryn! I’m flattered and delighted that you like the tables. I’ll be sure to pop over to your party. 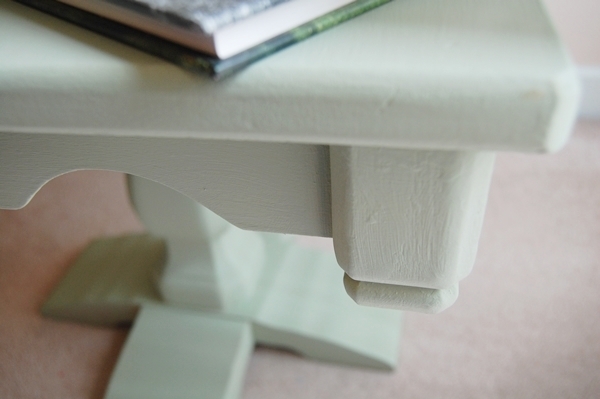 These painted tables are so pretty, definitely evocative of a coastal cottage! Thanks for sharing at What’d You Do This Weekend?! Thank you, Joy. The room is a work in progress, but it’s comely along. Happy to share at What’d You Do This Weekend? Thanks for stopping by. 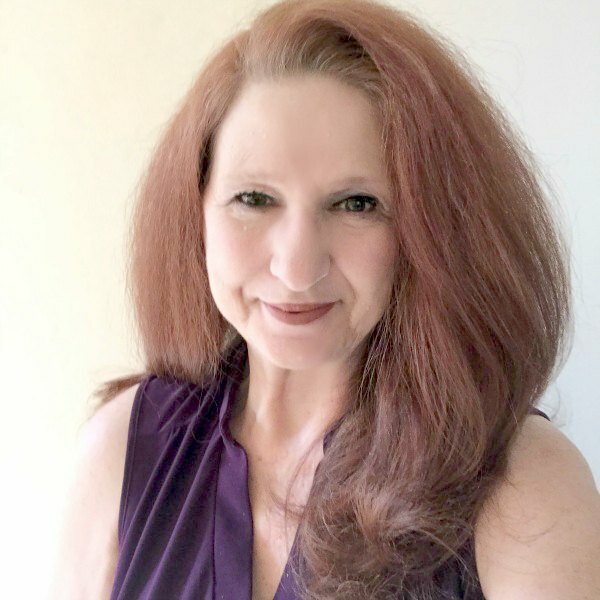 Beverly, the Weekly Feature Series is live. Head on over to check out your feature and the other 24 features from the week. 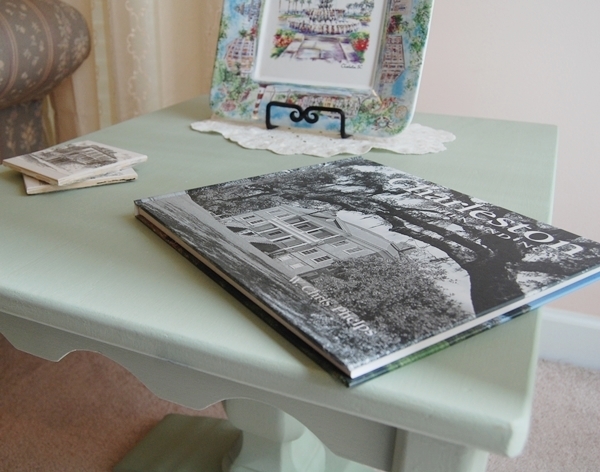 Thanks for the link and thank you again for featuring my tables.